One of my favorite parts of Hendricks County is the northwest section that includes the towns of Pittsboro, Lizton and North Salem. I spend a lot of time in that portion of the county for my parks & recreation job that includes McCloud Nature Park, for my daughter&apos;s softball team, eating calzones at Perillo&apos;s Pizzeria and visiting a good friend of mine who lives in that area. So when I caught wind of a new restaurant opening up in May in Pittsboro, I made a point of stopping in at The Bruin House as soon as possible to check it out. Located at 12 E. Main St. in Pittsboro, The Bruin House opened May 15 to celebrate the high school that serves this area of Hendricks County -- the Tri-West Bruins -- and to provide good food and live entertainment to the residents of this rapidly-growing community and to visitors from all over. So, my softball-playing daughter -- who currently holds the title of Pickiest Eater in the Solar System -- and I jumped into the car and headed over to The Bruin House for lunch. As we stepped inside, we were immediately met with the smell of hamburgers cooking, and my already empty stomach began growling even more. A friendly staff member promptly greeted and seated us in the family dining section at the front of The Bruin House and quickly brought us our drinks. We perused the menu, which includes appetizers, salads, soups, burgers, sandwiches, wraps, pizza, and a few entrees. My ultra-picky daughter approved of the kids&apos; menu choices, which are chicken fingers, grilled cheese sandwich and macaroni and cheese. I did not partake -- being the responsible parent that I am -- but I made a mental note of the wide selection of domestic and imported beers and wine that are on the menu, too. Next time. My daughter ultimately went with the chicken fingers, while I couldn&apos;t resist The Bruins Burger. 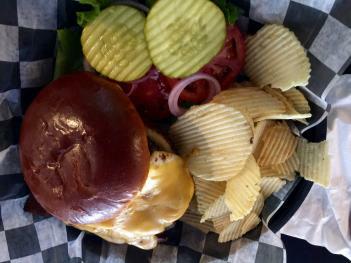 You just can&apos;t turn down The Bruins Burger at The Bruin House in Tri-West Bruins country. After our cheerful waitress took our order, we looked around the place admiring the wall hangings that celebrate the athletic accomplishments of Tri-West High School over the years. There are photos and jerseys and banners hanging throughout, and it&apos;s fun to look at the memorabilia even if you&apos;re not from the area. I&apos;m a sucker for youth sports, so this atmosphere and decor is right up my alley. Our food came out quickly, and we could tell from the steam rolling off it that it was fresh. The Bruins Burger includes a large patty (a half-pound patty would be my guess), topped with a fried egg, and a pile of condiments on the side -- tomato, lettuce, red onion, and pickles. You make your burger the way you want it and dig in. My Bruins Burger was excellent, and it filled me up quite well. 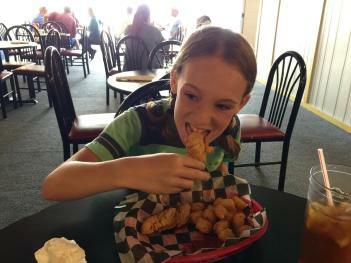 I cringed, though, as my picky daughter took a ridiculously small nibble of her first chicken finger. Would The Bruin House pass her unfairly stringent test? The first mouse-sized nibble earned a second, slightly larger nibble which was quickly followed by a normal-sized bite, a smile, a thumbs-up, and even an "Mmmmm!" I just about fell out of my chair in shock. I was even more stunned to watch her devour her entire basket of chicken fingers, mentioning several times how good they were. Whatever The Bruin House is doing to cook their chicken fingers, they need to patent it. So we really enjoyed the food, the service and the atmosphere, but I had heard there was live entertainment at The Bruin House, yet I couldn&apos;t imagine how they&apos;d fit a band in where we were eating. 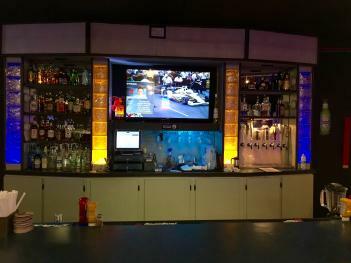 It wasn&apos;t until I noticed a hallway toward the back of the dining room that I discovered the spacious bar area that includes a full bar, a stage, televisions all over the place, a large projection screen and lots of tables. Ah HA! THAT&apos;S where they put the live entertainment! They have pool tables back there, too, so the adult section of The Bruin House looks like a lot of fun for me to check out with my wife at a later date. We had a great experience at The Bruin House, and we&apos;ll definitely be back -- with the kids and without. Most of the items on the menu are in the $8-$10 range, but the portions are large and filling. Our service was excellent -- our waitress was friendly and attentive without being overbearing. The men&apos;s room was well-lit and clean, and my daughter reports that the ladies&apos; room was in the same condition. The decor in the family dining section is fun, and the bar in the back looks really cool. The Bruin House is definitely worth checking out. You just might see me there, too! 12 E. Main Street, Pittsboro, Ind.